You are here: Home / Crafts / I’m Back! Oh my goodness, I’ve been gone. I had thought I might blog while out of town but I didn’t. I am still not really back into the swing of regular life yet, so I’m going to share something I made while I was at my Dad’s house. I actually made 3 of these, one for each grandchild, but didn’t take photos of the process and in fact only took shots of the last one because I didn’t get it mailed off yet. First, I had a wonderful 2 months visiting family in Texas and New Mexico. I got to remember what it was like to take kids to school and activities (oh yes, you do get right back into the swing of that!) and cook for a family etc. It was hard to leave them but I then went on to visit my Dad and we had a great time eating all of the Mexican food we could hold and I got to meet some family from that area I had never met and see some I had not seen in a long time. All in all very fun and satisfying. However, now, back to regular life and my very neglected blog. 🙂 I will likely post some of the many MANY photos I took while traveling, too. But not today. So, the project is made from the paper mache mash you can find here. 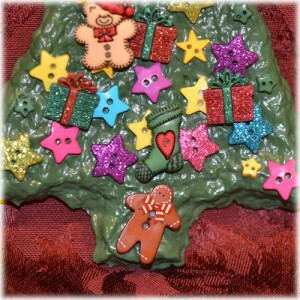 I used that and just free-hand shaped it into Christmas tree shapes. I cut a little piece of wire, made a loop and stuck it in the paper mache at the top and made sure it was anchored in there. I also made sure the ends of the wire stuck out to the sides (not out of the paper mache) instead of down as I thought this would make it more secure. This made a nice sturdy hanger (I put a piece of ribbon but you could use those ornament hangers). Oh, and being made of paper, this ornament is really really light. You can see the wire look at the top. I let them dry at least overnight and then finished drying in the oven (about 200 or so degrees F –I think my Dad’s oven runs a little hot tho –keep an eye so they don’t burn or get too crispy). They didn’t take long since they were fairly dry after sitting out and being partially dry. I just wanted them to be thoroughly dried before I painted them. Then I painted them green. I had to mix blue and yellow since the green I had bought was dried out! Yes I took it back but later and yes, they gave me my money back, but I had already painted my trees, so I didn’t need more paint. The color was great but I was glad I had bought a few colors when I was at the craft store. Anyway, I put on 2 coats to make sure it had a nice strong color. I did put a coat of Mod Podge over it too, just to give it some protection and shine. I had bought all of these cute little buttons at Hobby Lobby (we don’t have one here so I really kind of went crazy in there!). You can see in the picture some of the cute ones they had. I really like the glittery stars. For my Granddaughter’s I had ones that looked like flipflops and I forget some of the others, but they had such a great selection I bought quite a few different sorts. Some of them had loops on the back and wouldn’t lay flat but I just nipped those off and they worked just fine. I glued it all on with just regular white glue. Since they are just ornaments and not toys I think it will hold. If the holes in the buttons bother you you could find other items to decorate with. I forgot to take a photo of the back, but I put their names and the year and Christmas and who it’s from on the back too (Sharpie!). I always did ornaments for my kids and now for my Grandchildren, every year. This way they will be able to remember when they pull them out (hopefully) every year. These were SO easy and fun to make. You could easily make them WITH kids too. Now, I’m off to check on Handmade Monday, which I have sadly neglected for way too long. I hope the rest of you will check them out because they have some amazing things and I KNOW they are all making beautiful things for Christmas by now. And I hope that you all will be back soon, I promise to get right back into my normal routine (and post some fabulous vacation photos). Welcome back – we have missed you. Sounds like you had a fabulous time though and so good to spend time with your family. Looking forward to seeing your pics in future posts. Your Christmas tress are lovely and the buttons look great – who cares about the holes? Hope you have a good week. Welcome back Susie. It sounds like you had an amazing break. 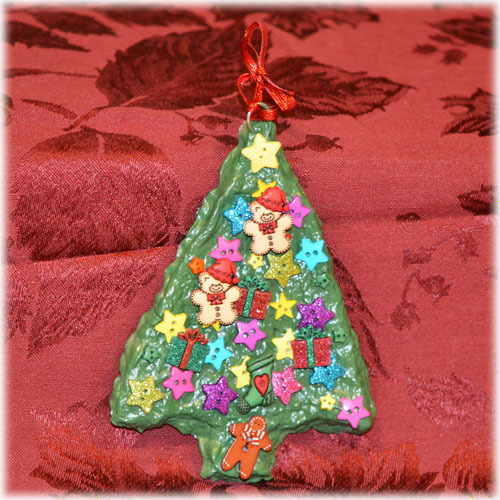 That tree is lovely and I love the idea of making ornaments for kids and grandkids – bringing them out every year will be memorable. I think this would be a good project to do with the kids too. Welcome back. Was beginning to wonder where you had gone. Sounds like you had a great time. Love the ornaments and great idea putting a name and year on the back. It will make for good nostalgia when they get used for many years to come. Hello Susie !!! Happy to hear that you had good time with your family ! 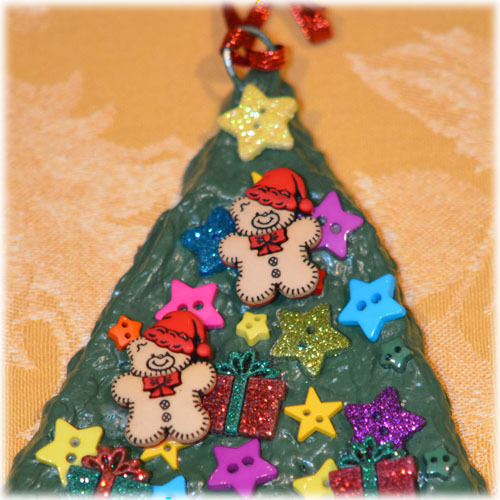 Love your ornament, it’s always a pleasure for the family or friends to have handmade’s gifts ! Love the little buttons and glitters ! Hugs and kisses my friend ! Sounds like you had a wonderful time. Love the Christmas tree. I love visiting the States and going into all their craft stores – my particular favourite is Michaels! I love the idea of buying or making my children a christmas decoration every year but sadly I am not that organised. It is such a lovely idea and your trees are just great.